This is a double layer of purple and yellow heaven. 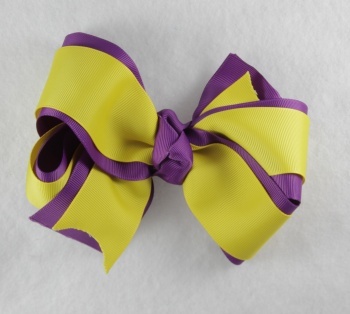 This is great for a school spirit bow to match your favorite team color. There is a 2.25" purple grosgrain ribbon topped with a 1.5" yellow grosgrain ribbon. The same purple ribbon wraps the center in a French knot and is on a French clip. This is a total of 70" ribbon, each layer has 35"!